Extra titbit. If you’re feeling really adventurous take the reverse bungee ride – not for the faint hearted! Whenever we have visitors the first place we take them, often jet lagged and little bit bleary-eyed is Clarke Quay. I’m not sure if it’s the colourful shutters of the MICA building (housing Government ministries) that I think will awaken their tired eyes. Or the towering city scape that comes in to view as you round the bend that I hope will impress them. Or the mix of bars, cafes and restaurants that can feed them whenever the need arises? Maybe it’s my old love, the Merlion – the original guardian of the city – who stands tall and proud at the mouth of the river, that I want to show off? Who knows? I just feel it’s a great place to introduce anyone to this lovely city we call home. It has such a lot of history attached to it as the first port of Singapore. As recent as the 1970’s traders were still pedalling their wares on the banks of the river, and Clarke Quay was a noisy mix of bumboats (tongkangs) and lighters (twakows) unloading their cargoes. Ever since Sir Stamford Raffles step foot on the northern bank of the river and saw its potential as a free port it has been a hubbub for the island. But it hasn’t always been the lovely stretch of water it is now. With all the heavy traffic it encountered and the number of people living on, by and around the river it became heavily polluted and congested. In 1977, the then Prime Minister, Mr Lee Kuan Yew began a clean up operation that took ten years to complete. Involving relocating many hawkers, squatters, industries and immigrants, this clean up has got to go down as one of the biggest successes for Singapore. For the river is now beyond recognition with it’s attractive waterway walks, bustling restaurants and grand hotels that line the river. At the same time it has stayed true to it’s rich heritage and celebrates its history. So, if you’re looking for a relaxing day out and don’t mind a stroll. Or, if you’ve visitors who have just arrived and you don’t have a clue where to start, here’s my suggestion for a fab day by the river. Take the MRT to Clarke Quay station, come out at the river, turn right and head towards Clifford Pier. On the way you will find many statues to catch your eye – from the large bird sculpture (symbolising peace, serenity, the joy of living and the power of optimism apparently! ), to the often photographed jumping boys or ‘The First Generation’ to give them their proper names. In fact, if you are taking young children, make a game of this – challenge them to find the jumping boys, the cats, the traders, the bullock cart, and even Sir Stamford Raffles himself (on the opposite bank, but easily spotted if you are keeping a look out). As you head under South Bridge you will enter Boat Quay which will be obvious from the plethora of eateries that spring up along here. You will be encouraged to sit down, relax, have a bite to eat or ‘just a drink madam?’ In fact, this is one of only a few streets in Singers where you will be approached by restaurant staff keen for your custom. But this is Singapore, so don’t worry, you can easily say no thank you and they won’t be offended. There are many options, so if you are hungry give somewhere a try. 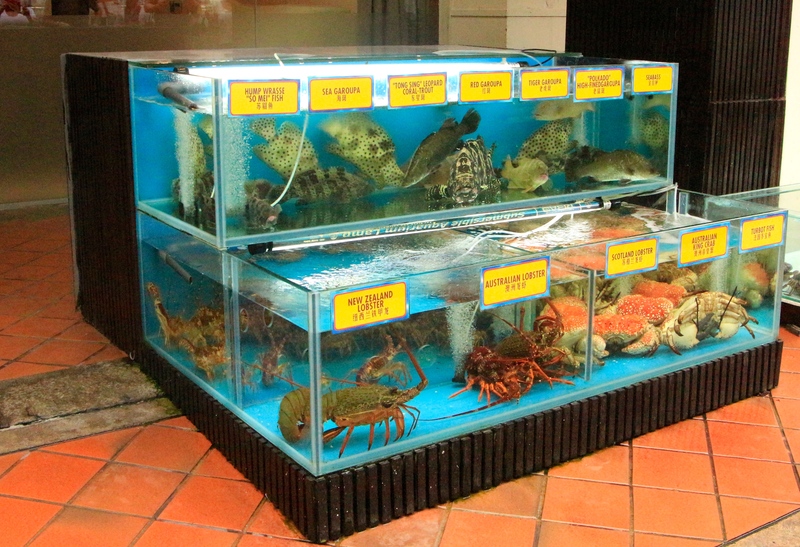 Fresh fish and shellfish are on display too so you can even pick out what you’d like served up! Fed and watered? Then keep walking and you will saunter past The Fullerton Hotel – an iconic hotel that has been on the same site since 1928 and had previously dominated the city’s skyline (pre skyscrapers and MBS). Placed under conservation at the beginning of last century, The Fullerton is one of those hotels that oozes colonial Singapore. If you want to soak up some of its history you can visit one of its restaurants or bars. If not, just oggle those that are as you walk by. Keep going and walk around the mouth of the river heading for the Merlion Park. Standing 8.6 meters tall, this is where the guardian of Singapore now lives after moving from further down the river in 2002. 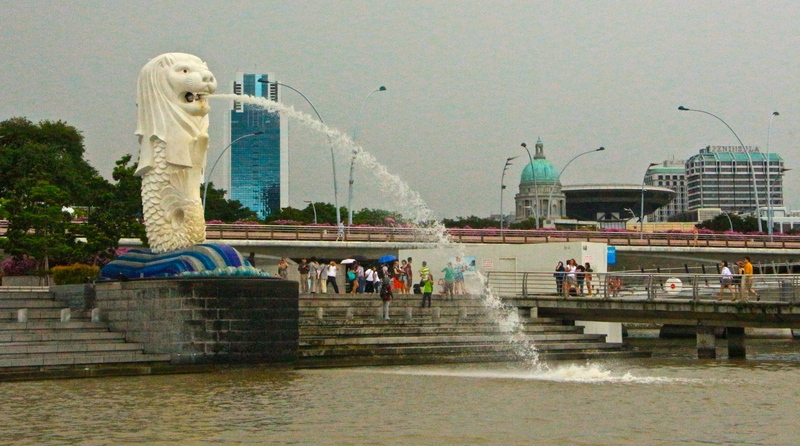 Join the other tourists and see if you can capture a photo of the Merlion spouting water directly in to your mouth. This really is selfie heaven so be patient with the many tourists that are around. It’s worth it though for that one good shot. Look out for the Merlion cub too that sits just behind mum. Always a nice photo opportunity for the kids. Oh, and you may just notice another famous landmark or two whilst you’re there too. More photo opportunities as you try to lift the famous Marina Bay Sands with your bare hands, or push round the Singapore Eye. If you’re not sure what to do, just look around and take your cues from those in the know. Once you’ve had your fill of photo taking head towards Clifford Pier and buy a ticket for a river boat ride. Yes, it’s worth it! Here you’ll get a chance to sail down the river you’ve been meandering past for the last hour or so. Jump aboard (or step precariously, depending on your sea legs – but it’s completely calm so no need to worry!) a traditional bumboat. 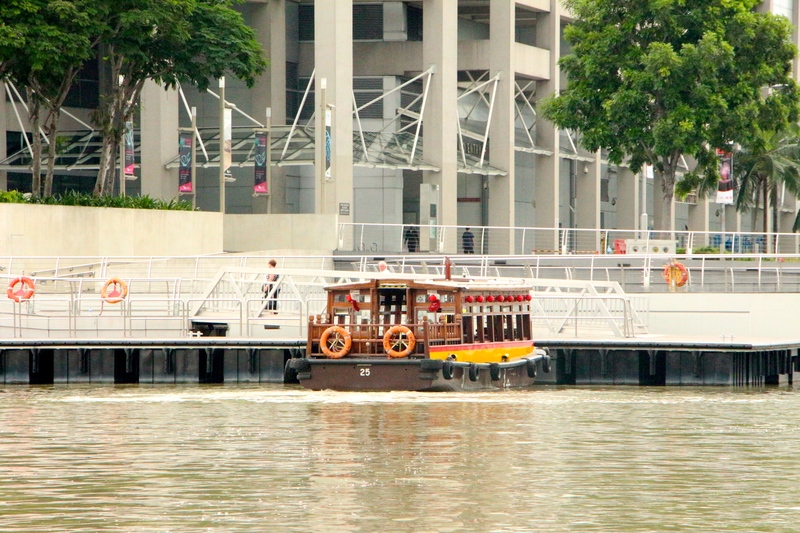 They all have video commentary that will tell you more about the fascinating history of the river and Singapore itself. This is a great thing to do come rain or shine as on a hot day you can catch the breeze as you sail along sitting outside the boat (though you don’t hear the commentary then) or sit by a window and enjoy some shade. It’s also the perfect shelter from the showers that can catch you out. Take a full round trip if you can and you will see many more famous landmarks such as the Old Parliament House, the Asians Civilisation Museum and Marina Barrage. Not to mention you get a full view of the CBD and the gob-smackingly tall skyscrapers. You can hop on and off if you wish or can choose to end your journey at any one of it’s 13 jetties. Personally, I’d say go for a round trip and see as much as you can and end up back at Clifford Pier. 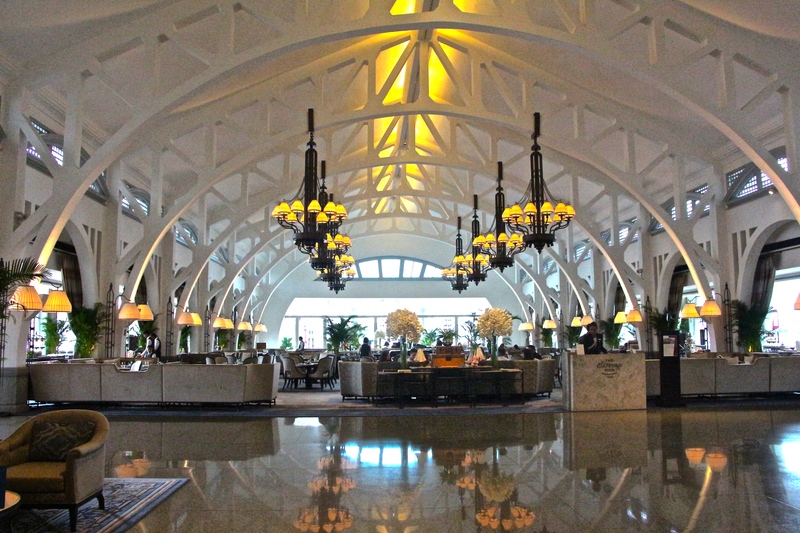 This is purely because that way you can now gawp at, for me, one of the most splendid hotels in the area – The Fullerton Bay Hotel. I’m not sure of the technicalities, but the hotel is built on a public walkway (I’m also not sure they’ll appreciate my sharing this information so happily either). This basically means anyone – yes, even you in your comfy shorts and walking shoes – can stroll through the public areas. And these are public areas TO DIE FOR! I never tire of staring when I enter the lobby. The beautiful – and I mean stunningly beautiful – Clifford Pier restaurant just whisks you away to a place where you want to call everybody ‘dahhhling’ and quaff cocktails and sip Ceylon tea all afternoon. In fact, you can do exactly that as this one of the best places for afternoon tea (see Time For Tea, Fullerton Bay Hotel). Of course, if it’s later in the evening; ah hell, even if it’s not, you can head up to The Lantern Bar. Taking it’s name from Clifford Pier’s historical Chinese name ‘Red Lantern Pier’ this is one of my favourite spots for a drink or two as the views are lovely. Not so high up you feel sick, but high enough to take your breath away. There’s a relaxed vibe most nights with a DJ playing some nights – it can get busy so book if you’re keen to go on a particular night. But, during the day it’s also great for a juice, cup of tea or cocktail too and you can get bar snacks if you haven’t partaken in any of the restaurants earlier. Now, sit back, relax and enjoy the view. For me, this is the perfect day out for newbies – and oldies – to Singapore. A great introduction to the city without being overwhelmed and a good way to check out what you might like to do next.